Dou doesn’t have goal. Perhaps that confuse you. But many Japanese understand dou without any descriptions. I know it is difficult for Westerners. But I don’t know why. I think up the idea. Japanese philosophy of life is different from that of Westerners. Westerners think their life as what they do. Japanese (of course not all Japanese) think our life as what we will be. By the way, Japanese language has many words about being, and English has many words about doing. 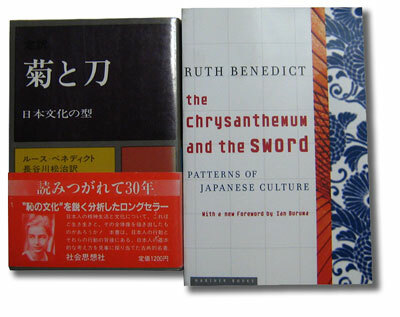 Ruth Benedict wrote “The Chrysanthemum and the Sword: Patterns of Japanese Culture” in 1946. Her work is very great. She said that Japan has a shame culture and Westerners has a guilt culture. It is one-sided but includes truth. Guilt is caused by doing. Shame is caused by being. For doing, the target is object. They do something. They want to get something. The target is out of themselves. For being, the target is myself. We want to be something. We do as what we will be. I am not God or Buddha. I will not be God or Buddha. What I will be will not be finished forever. So, dou doesn’t have a goal. The West culture is great. That has brought us wonderful civilization. I really appreciate it. I think the fundamental power of the West is competition. It is necessary for us. But competition has caused some problems. Dou doesn’t have competition. You wonder. Ju-do or Ken-do are martial arts. They make winners and losers. Isn’t it competition? Perhaps that is difficult for Westerners. Indeed it is competition, but competition against myself. The winner is the person who wins themselves. Japanese don’t admire the person who win the game but lose themselves. Dou has various ways. Various people train and practice by various dou. Dou seems to have various dou. That is not wrong. But Japanese have the same sense about dou. That is the principle of dou. The masters of dou say the following words.